*** At the start of the 2019 recruiting cycle, the Sooners had one name at the top of their board at Inside Linebacker, and that was Jonathan Perkins. *** Perkins, a 6′ 215 lb athlete out of Cajon High School in San Bernadino, CA. was offered by the Sooners back in October of 2017. *** He made his first visit to Norman back in February of 2018 for a junior day, and shortly after, in April, he committed to the Sooners. 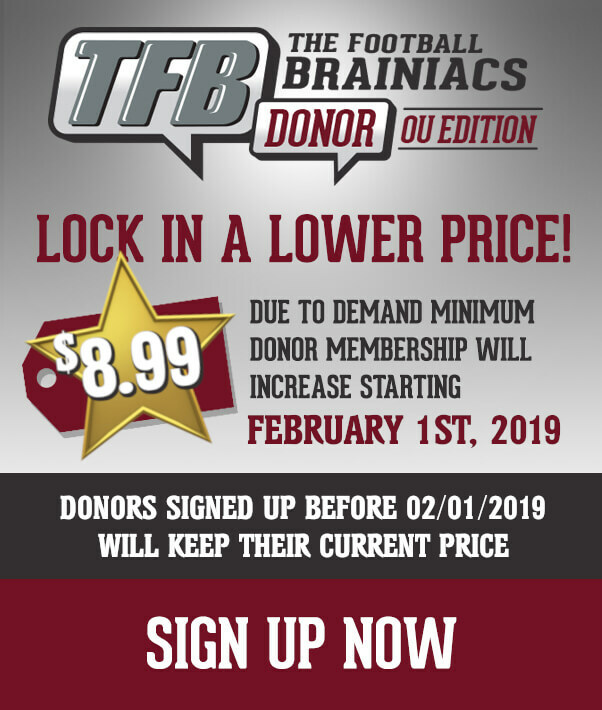 *** While the linebacker room in Norman is well stocked (Kenneth Murray, Caleb Kelly, DaShaun White, Brian Asamoah, and Levi Draper all returning) many have wondered why the Sooners basically shut down linebacker recruiting after securing his commitment. *** After watching his film, I think you can see why the Sooners are so high on him. He is violent, fast and has tremendous instincts. *** Now, with Caleb Kelly seemingly having returned to his SAM role, could that potentially open up another ILB spot? Perhaps. But adding another linebacker would be icing on the cake as the Sooners have already gotten their number one target. I’m back from my week-long trip and ready to rock and roll till early signing period. Congrats to Sooner nation on another Big 12 Championship and a playoff berth. Y’all were busy while I was gone! ***David Ugwoegbu tells me that OU will be by to see him today. David said Lincoln and coach Kish will be visiting him. ***Marcus Stripling also told me that the Sooners will be in the house tonight as well. ***Jaden Davis tells me that Lincoln Riley and Kerry Cooks will be in his home with him on Wednesday. I asked Jaden if he plans on signing in December even if a DC has not been announced. He said, yes. ***Also checked in with the father of 2019 DB commit, Woodi Washington. They plan on taking a return visit to Oklahoma this weekend. Washington already took his official visit to OU. This will be an unofficial visit. Washington’s father also said that they plan on signing with Oklahoma in December with our without a defensive coordinator being named. ***Based on what I’m hearing it does sound like OU will wait to announce staff changes till after the bowl game. I’ll post my thoughts on why I think that will be the case in a later post. ***I asked someone today how Bookie was feeling about not starting last weekend during the Big 12 Championship. Was told, “he was disappointed but he knows he’s been struggling and he knows he’s got work to do. He’ll be fine”. ***Now that I’m back, I’m going to be digging on the Jordan Battle situation. I would have thought an announcement would’ve come by now but I’m starting to think that Alabama hasn’t given him the green light yet. A few minutes ago, 2019 wide receiver Demariyon Houston, out of Oklahoma City, OK, announced his decommitment from The University of Texas. Houston had been committed to the Longhorns since July and while he has been quiet for the most part, it appeared he was solid in his status. Could Oklahoma losing the commitment of Arjei Henderson last week be a factor? Perhaps, we will be keeping an eye on that obviously. The Sooners are in the market for potentially two more wide receivers and they were scheduled to go out and see Brandon Pierce who is at the College of the Canyons junior college today. We are still waiting to confirm if that visit happened. Should OU choose to push on Houston, this could quickly swing in their favor as he is best friends with running back commit Marcus Major and they have previously stated a desire to play together in college. More on Houston Below from Super K.
***Yesterday afternoon I checked in with speedy JUCO WR, Brandon Pierce (College of the Canyons) and he told me that Gundy would be by to see him later that day. Pierce said he sent his college transcripts to OU and added, “he (Gundy) said he would come by with the draw up of classes he needed me to take”. In case you’ve forgotten, Pierce hails from the same JUCO as Marquise Brown and according to the head coach at College of the Canyons, Pierce may actually be a hair faster than Brown. ***As you know by now, in-state 2019 WR, Demariyon Houston (Millwood) decommitted from Texas, last night. Last week I checked with Houston and he said he had not heard from OU. I checked with Millwood head coach this morning and he tells me that they still have yet to hear from OU regarding Demariyon. So, as of now, it doesn’t seem that this decommitment had anything to do with interest from Oklahoma. *** A couple weeks back, the Sooners lost a piece of their 2019 class when JUCO DE/EDGE Jacoby Jones decommitted and subsequently committed to Texas after taking an official visit to Austin. *** Stokes had let me know that he had been in contact with Coach Thibodeaux for a week or so through messaging and at the time he felt as though OU was gauging his interest in them. *** Stokes is 6’4″ and 250 lbs and he has recently picked up offers from Oregon and Virginia Tech. *** Super K is very familiar with LaRon and we will both be working to bring you any updates as they come through, but he is one to keep an eye on for sure. Coincidentally, Oklahoma is set to meet Alabama, who happens to employ Pete Golding as its co-defensive coordinator/inside linebackers coach. Golding was Riley’s reported top choice almost from the moment Mike Stoops’ firing became official in mid-October, but sources told FootballScoop a Golding hire appears off for now. Keywords here are “appears off” and “for now”. Everything we are hearing from our sources around OU is that Lincoln isn’t saying anything to anyone on the staff about what he plans on doing. I’ve also spoken to recruits who have said Lincoln is telling them he will make his decision after the bowl game. I’ve also been told he has articulated to folks that he will be bringing in a defensive coordinator. So, the idea that the staff is going to stay the same doesn’t really vibe with what I’ve heard. You cannot risk a shot at a national championship with any distractions. And, both Bama and OU are playing one another. Just my personal feeling but I don’t think this is dead at all. In fact, the conspiracy theorist in me makes me feel like the timing of this report and the fact that it specifically addresses Golding was intended by said sources to give both parties the ability to do their job without distractions.